Yesterday, I anxiously read the final page of the “Broken Bone China,” (Tea Shop Mystery #20 by Laura Childs). This reading probably has set a record for me — three days; unfortunately, not three entire days — that would be a perfect world! In my little corner of the world perfection is warm sunshine in which to appreciate a delicious cuppa tea while being engrossed in a suspenseful mystery. Okay now that I digressed let’s get back to the job at hand — book review. The mystery opens with Theodosia and Drayton experiencing afternoon tea while riding in a hot-air balloon. To be perfectly honest, Theodosia is enjoying afternoon tea while Drayton is apprehensive of the entire experience. Being one who shares Drayton’s apprehension (putting it politely) of heights the description provided by the author had me clinging to the sofa arms for dear life. To add to Drayton’s anxiety a drone appears in the sky next to their balloon in what appears to be a search for a particular group of balloon passengers. In it’s continued search the drone moves on to the balloon next to theirs and continues to attack the balloon causing it to explode while rapidly descending to the ground. Might I add that all this excitement happens within the first chapter! Wow, what a great start. I was hooked! Having witnessed this horrific event Theodosia and Drayton feel an obligation to “assist” Detective Tidwell in finding the person(s) responsible for the downing of the balloon, especially after the fiancé of a close friend and local B and B owner is accused. At the on start of their investigation they also discover that a priceless historical flag and a large sum of money from a local tech corporation are missing. Coincidently, all have a definite connection to the believed target — Don Kingsley. The investigation has to be conducted as well as their scheduled events at The Indigo Tea Shop — A Nancy Drew Afternoon Tea, daily tea/lunch servings, and climaxing the week with a Beaux Arts Tea at the historical Portman Mansion. Let me stop the story details at this point and just add that I have read most, if not all, of Laura Child’s Tea Shop Mystery series and this particular book would definitely be among my favorite of the series. Most of my reading is done via ebooks and I enjoy being able to highlight, note, and share excerpts from the books I am reading. During my reading of Broken Bone China I made note of 13 excerpts that I found interesting or in reference to a tea. Laura Childs is among a special group of tea authors for me as her references/descriptions/details of teas are always correct. 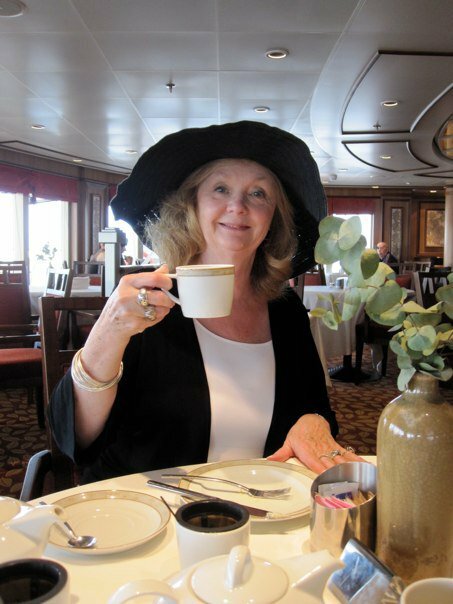 She has historically taken the research time to know her teas as well as her Charleston. In conclusion — I definitely would recommend this book to those who appreciate tea, a good mystery, and tea rooms. Lifting my tea cup, I am wishing all good tea, books, and life events. Enjoy!